Having recently opened the all-new Ghostbusters Experience and with its continued commitment to offer one of a kind, unparalleled entertainment, Madame Tussauds New York remains a top destination for New York locals and visitors alike. Madame Tussauds is excited to offer its guests the opportunity for kids to receive complimentary admission to the iconic attraction. 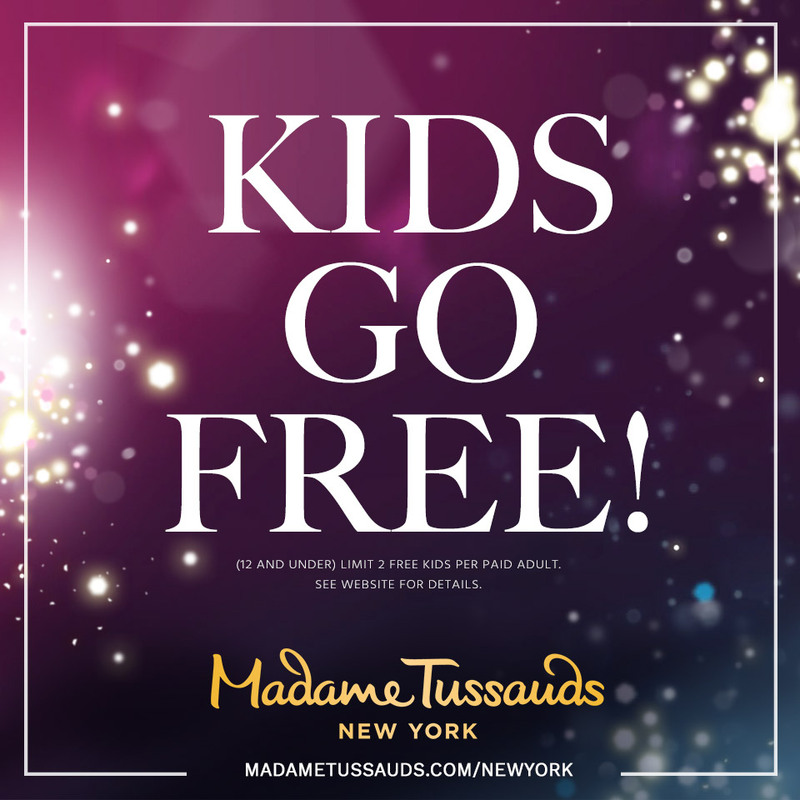 Madame Tussauds, located in the heart of Times Square, will run their new “Kids Go Free” promotion from September 19th through October 29th. During this time, kids ages 12 and under, when accompanied by an adult ticket holder, will receive free admission to the one of a kind attraction. Madame Tussauds believes in offering unrivaled entertainment in the Big Apple and looks forward to honoring their younger fans through this limited time promotion. For every 1 adult ticket, 2 kids will enter for free. Kids receive the same ticket package as the adult they are with. Add-ons such as Ghostbusters: Dimension, Marvel 4D and others are subject to an additional upgrade charge. Please visit Madame Tussauds New York's website for more details. Madame Tussauds New York, prominently located in the heart of Times Square, is more than just a wax museum; it is an iconic “must do” New York experience and home of the Ghostbusters Experience and Ghostbusters: Dimension Hyper-Reality Experience. There are no velvet ropes or obtrusive barriers to keep guests from interacting with over 200 of the world’s most recognizable and influential icons. The fully immersive, one-of-a-kind attraction is great for families and visitors of any age. With particular dedication to regional visitors, local admissions offers are available. Visit www.madametussauds.com/newyork or call (866) 841-3505 for more information. Visit www.ghostbusters.madametussauds.com for more information about Ghostbusters Experience. To join in the conversation and follow the latest updates, be sure to use #GBXP across all social media platforms. Madame Tussauds - A Favorite Family Vacation Destination! Madame Tussauds Is A Great Day of Fun in NYC! Visiting NYC? Stop By Madame Tussauds Wax Museum!